Our Mayor Scrooge McDuck laughed in the face of his poor foes yesterday, fresh off a win for his proposal to max out sugary drinks from restaurants, movie theaters, and food vendors at sixteen ounces per cup. Despite the various loopholes, like the exemption for the mythic 7-Eleven Big Gulp and the existence of refills, the ban is being touted as “historic,” and Bloomberg did a hell of a job pushing this thing through with little resistance, if he does say so himself. 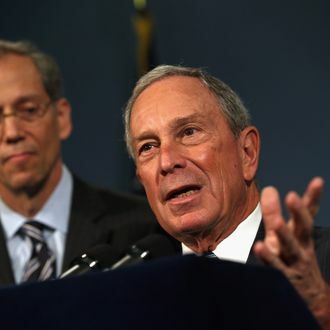 “This is the single biggest step any city, I think, has ever taken to curb obesity,” Bloomberg declared yesterday. “It’s certainly not the last step that lots of cities are going to take, and we believe that it will help save lives.” Then he did an end-zone dance.